Vice President Richard B. Cheney has had a distinguished career as a businessman and public servant, serving four Presidents and as an elected official. Throughout his service, Mr. Cheney served with duty, honor, and unwavering leadership, gaining him the respect of the American people during trying military times. 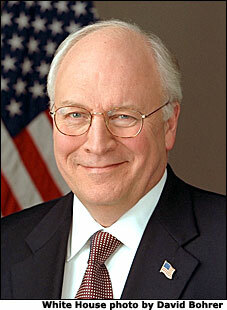 Mr. Cheney was born in Lincoln, Nebraska, on January 30, 1941 and grew up in Casper, Wyoming. He earned his bachelor's and master's of arts degrees from the University of Wyoming. His career in public service began in 1969 when he joined the Nixon Administration, serving in a number of positions at the Cost of Living Council, at the Office of Economic Opportunity, and within the White House. When Gerald Ford assumed the Presidency in August 1974, Mr. Cheney served on the transition team and later as Deputy Assistant to the President. In November 1975, he was named Assistant to the President and White House Chief of Staff, a position he held throughout the remainder of the Ford Administration. After he returned to his home state of Wyoming in 1977, Mr. Cheney was elected to serve as the state's sole Congressman in the U.S. House of Representatives. He was re-elected five times and elected by his colleagues to serve as Chairman of the Republican Policy Committee from 1981 to 1987. He was elected Chairman of the House Republican Conference in 1987 and elected House Minority Whip in 1988. During his tenure in the House, Mr. Cheney earned a reputation as a man of knowledge, character, and accessibility. Mr. Cheney also served a crucial role when America needed him most. As Secretary of Defense from March 1989 to January 1993, Mr. Cheney directed two of the largest military campaigns in recent history - Operation Just Cause in Panama and Operation Desert Storm in the Middle East. He was responsible for shaping the future of the U.S. military in an age of profound and rapid change as the Cold War ended. For his leadership in the Gulf War, Secretary Cheney was awarded the Presidential Medal of Freedom by President George Bush on July 3, 1991. Mr. Cheney married his high school sweetheart, Lynne Ann Vincent, in 1964, and they have grown daughters, Elizabeth and Mary, and three granddaughters.